I wish I could say that this was without a doubt the best summer ever. This post appeared on ibdbaggage.com. We all come with a little baggage. I’m feeling better after having ileostomy surgery. I&apos;m off meds for ulcerative colitis, no longer ridden with having to know where every restroom is, normal face, and energetic. Yet this summer takes the cake as one of my worst. My anxiety monster took over most of my days, so I found myself more often than not, staying home. Hiding in my room. I look back and think… What did I really do this summer? I promised myself that I’d be honest about my ostomy journey, so if I’m true to that, I feel compelled to map out why this summer felt like such a bust. Rarely do people admit this, but I was lonely. During a time where I felt so connected to other people with IBD, ostomies and chronic illness, I’ve never felt so distant. Not looking for pity because I only have myself to blame for this. I take full responsibility for my lack of enthusiasm when it came to being social. I acknowledge that my loneliness is not due to any shortage of people, because they are there. It’s my shortage of caring. I don’t care to grab dinner, I don’t care to go watch a movie or watch a baseball game, or go for drinks, and I certainly don’t care to initiate any of these plans. 1. I learned that similar to winter, summer brings wardrobe challenges. 2. I learned that thin summer tops or dresses sometimes reveal an ostomy bag. 3. I learned that sweating makes it difficult for the flange to adhere to my skin. 4. I learned that I *really* hate wearing anything with a waistband; jeans, pants, shorts. I would much rather stay in leggings or pajamas. 5. I learned that I actually need a convex appliance. My cute little button stoma sits too flush to my skin, so I need a convex wafer to help push it out. Every doctor and nurse along the way failed to mention this, and I’ve been spending thousands of dollars on the wrong ostomy products. 6. I learned that just as my confidence in the winter plummeted, like any girl, summer brings a whole new wave of body image insecurities. 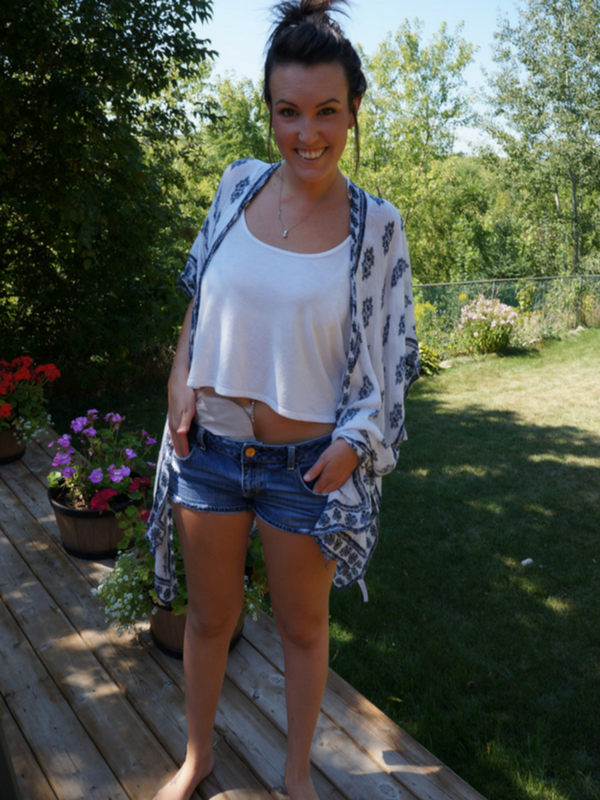 As comfortable as I am with talking about my ostomy, and even showing it off, people stare. They always stare. And in correlation to that, my hair really does matter. What is a cute outfit if you don’t have cute hair? 7. I learned that there really are good people who don’t care about the ostomy. And a potential dating life is a possibility. But again, with another looming surgery, I choose to be alone in fear of dragging another person into the medical drama. I can’t bring myself to ask someone else to carry the extra baggage. 8. I learned about other people who are struggling with this anxiety monster. And that I really am not alone. I have connected with people at work, and in my own family who I never knew struggled. 9. I learned that a year is really not that long. In June 2015 I underwent the first of three surgeries. September 2016 was the second. In what felt like a lifetime of difference, I really don’t have that much further to go. With still one more surgery ahead, am I looking forward to summer 2017? Oh yes, I am. And there are BIG plans ahead. Stacey lives in Toronto as a teacher and patient advocate.